Thanks so much to everyone who visited and entered the Skinfood Giveaway, and congratulations to the winner, Samantha T! Sorry I've been a little out of commission the past week-and-change. Ever have one of those weeks YEARS? Details follow, for anyone interested--but first, some sponged nail art! You know how, in the movies, the well-meaning science guy will kind of chuckle at something and then laugh a little and then eight seconds later he's cackling like a maniac and throwing the switch? That was pretty much me with this manicure. 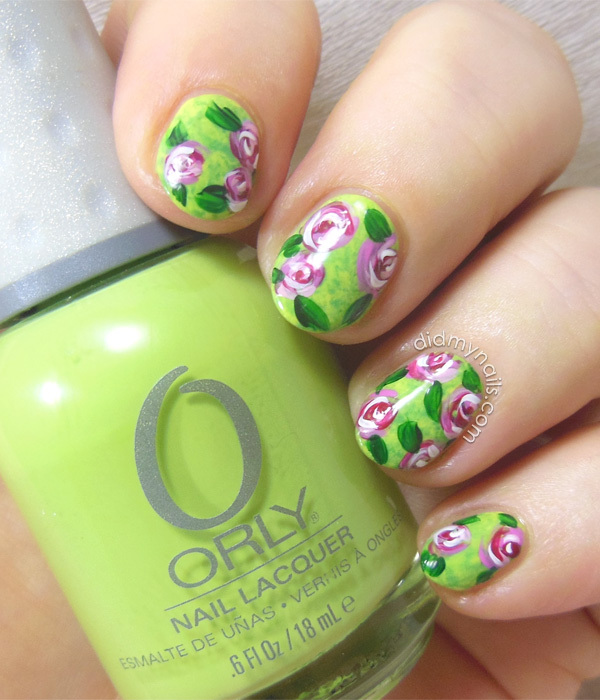 I started off wearing Orly Rock Solid and decided to spend more time with it. There were vague notions of something semi-galaxy-like and some unrefined curiosity about neutrals vs. complimentary colours... I started sponging, the colours all started to blend and build, and the next thing I knew it was pitchforks and torches and villagers fleeing in terror. I didn't remember to note every polish I used in sponging, but the main culprits are Wet n Wild Disturbia/Audace, Barielle Lilac Jelly Bean, OPI San Tan-tonio, and Sinful Colors Unicorn (yellow). Also white. * No modern artists should feel slighted by the writing of this post. I really do like those splotches and swirls. I gaze at them like they're static clouds to interpret, and I wonder at each moment of inspiration that chose to add this splash of bright red here or make that cluster of swirling lines look so much like a bird in flight. Then I see that other thing that looks like a naked dude and a snicker a little bit, and then I stop and wonder what actual grown-ups are doing tonight. And now for those promised/threatened details! Okay. For the last ten days, I have been sick as hell, but that's really just the tip of the ridiculousness iceberg. Setting aside the craziness and the drama that spent this last year trying to pass itself off as my actual life... As I mentioned in the last post, Husband and I finally found ourselves in the same country at the same time for long enough to go enjoy an amazing weekend at Hong Kong Disneyland. I could feel myself starting to come down with something as we headed home on Sunday, but the minute we walk in and sat down, we find out we have about a month to find and move into a new apartment. Fly into action, contact agents, start seeing flats all over the island and beyond, so much walking... actually find an incredible place! YES! Slight panic over the rush to get moved, but it's exciting, right? Oh wait, that part where I am sick as a dog. Lose days and days to that phlegmatic abyss...but I'm finally feeling MUCH better and back on task! Which is good, because let's give a warm welcome to the fabulous news that Husband has to go out of town again...and he can't get back until after moving day. So that's where I've been this past week or so. If my posts lag a little over the next few weeks, you can find me sitting in the middle of my living room floor, riding out a full-blown panic attack in a fort made of sofa cushions. Just one day left to enter the Threeversary Giveaway! Also, whoops! This post was totally supposed to be up hours ago (not that my 'meant to' schedule matters to anyone but me... ;p), but the day just went INSANE. After a fantastic weekend with Husband at Hong Kong Disneyland, I was all set to have a relaxing evening full of post prepping and movie watching, when an incoming text sent us into a flurry of activity that, in the space of maybe two minutes, swallowed pretty much the entirety of my next few weeks in one big gulp. Because what I definitely needed was a new challenge and a headache while I'm still getting back into the swing of posting again, right? Whatever. Anyway, don't be shocked, but I made some flowers! The base for these is Skinfood BL002, Melon Milk, which is one of the polishes in the giveaway! Although why it's BL and not GR I have no idea because blue it is not. It's a bright, electric honeydew green that's definitely unique among my stash. The formula was pretty much what you'd expect from such a bright, lemony shade, so yeah, there was a little streaking and pulling on the first coat, but it flowed easily and wasn't too thick or too thin. Day-wear adorable in two coats, camera-ready in three. Only I skipped the swatch pics and went straight for the nail art. The flowers are acrylic paints, gone swirly-like in an effort to show some highlights and shadows, but before I did those I was hoping to suggest a kinda textured, greenery-like background, so I hit Melon Milk with some saran wrap additions of Orly Green Apple, Essie Pretty Edgy, and Essie Mojito Madness. And then I ran out of the apartment with only one hand top coated because I totally lost track of the time and was running late for my dinner date with Mabel--sorry again, Mabel! We had soft shell crab rolls and tonkatsu and Kirin beer, and it was all kinds of delicious. So that's what my last few days have been like. Hope y'all are having a good weekend -- last chance to enter that giveaway before it's done! Just a few days left in the Threeversary Giveaway! In the meantime here's a manicure from, oh...almost a year ago? This was right before I took off for my scheduled summer trip to the US that ended up being three months long; then the hiatus hit, and then my nails kept breaking, and there was that Super Bowl commercial with the dog in the rain, but I finally dusted off my pics of these one-stroke flower nails. The base polish for these is Color Club Silver Lake, a fantastic, pale grey shade that I totally need to pull out again. Its formula didn't exactly wow me, though. The first coat was kinda chalky and streaky, but the second coat was better and would probably be well sufficient for people with steadier hands than mine. I needed a 3rd coat to even things out...which I didn't apply very evenly, so it got kinda thick, but that last part's on me. BTW, have I mentioned the Threeversary Giveaway? So that middle nail broke again because of course it did. My own fault, really, for allowing myself to decide that, yes, I did kinda like the new nail shape after all, and the length looked pretty good with it too. Because from the moment that thought was loose in my brain, the clock was ticking. Sure enough, before the sun had started to set I was snarling obscenities and cursing my traitorous brain for entertaining such a poisonous notion. I don't know what it is, but "happy with my nails" is a kiss of death. It's like when I travel, and the question isn't whether I'll break a nail but when the first one will go. And it's not like I'm using my nails to pry things open or anything; I break them doing super-coordinated stuff like turning around too quickly and jamming my hand into a wall, nails-first. Anyway! I have a bunch of spring and summer brights to wear, but with my new shorties I wanted to wear something just a little bit darker. I was also thinking about a little sparkle, to cheer me up, so I dove into the Big Box o' Untrieds and came out with a polish whose turn was long overdue, Orly Rock Solid. Turned out Orly Rock Solid was a fun polish and just right for my mood. From the 2011 Mineral FX Collection, it's nicely named, with a shimmering, granite-like finish, and the little dots of holographic glitter give it a gorgeous flare without overpowering the grey. The formula was good, just what I expected from an Orly foil/shimmer finish. A little thin on the first coat, which wasn't any cause for concern because I knew it'd build (I gave it a total of three, which is my usual). Rock Solid does dry to a slightly gritty texture which isn't bothersome, but a nice coat of SV smoothed things out and gave the bits of glitter and (I think) glass fleck a little extra shine. No! No, I can't risk even thinking it, much less typing it out. Change of topic, change of topic, um... Hey, how about that giveaway! And the milestones keep on coming! This is the 500th post at Did My Nails, and just like the three-year mark a few days back, I can hardly believe it. I'd have guessed maybe 200? 250? But the numbers don't lie, so five hundred it is! I wanted to do something fun to mark the occasion, but I'm already mid-giveaway (adorable Skinfood swag in pastel brights and yes, it's international). Then I realized it's been forty billion years or so since I did a new layout for DMN, so... new layout for DMN! And to go with, a composite manicure in corresponding colours..
With extra time for a do-over I'd have gone with black on that index nail, but I've been working like crazy over the past few days, both in graphics and coding for the new website digs as well as in Office, helping fine-tooth-comb a contract that represents just an obscene amount of planning and negotiating and late-night calls and herding cats. Plus I had to play boatloads of Disney Tsum Tsum. I mean, a girl's gotta have her priorities. So the white is Sinful Colors Snow Me White, which I think I have about 4 bottles of now (I keep picking it up when I'm in the States because it's so cheap). The middle finger is a base of Zoya Dove, with saran wrap daubs of the white, China Glaze Immortal, Wet n Wild Ebony Hates Chris, and more Zoya Dove. I got it really swirled and layered this time by just going to town on it, one colour after another, and I love how textured and detailed it looks! The acrylic paint flowers are sitting on top of Sation Shock Me Twice Pink, a fantastic, pink neon with an electric shimmer. 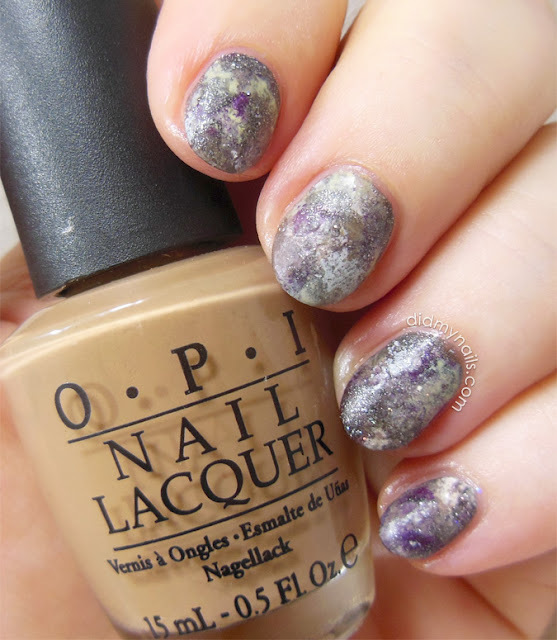 That polish is, in turn, sitting on top of a coat of OPI Did You Ear About Van Gogh? to help it build. I tried it over white first, but there were streaks and sadness. The pale beige, which is very near my own skin colour, was a better foundation for it. I've been sporting these nails for a couple of days now, wearing a lot of black and grey, and the splash of hot pink really pops! And hey, speaking of graceful segues? Don't forget to enter that giveaway! I had no idea how out of it I'd really been until I saw this pretty, new polish, assumed it was from this year's spring or summer collection, and then found out it was released an entire year ago. Whatever, though, it's brand new to me--and what's more, it's a purple that I couldn't resist! Most of the purples I wear are either because they're my grandmother's favourites or because Amanda dared me to, but this sweet shade literally made me do that dramatic little gasp you do when you see something and just gotta, gotta have it. 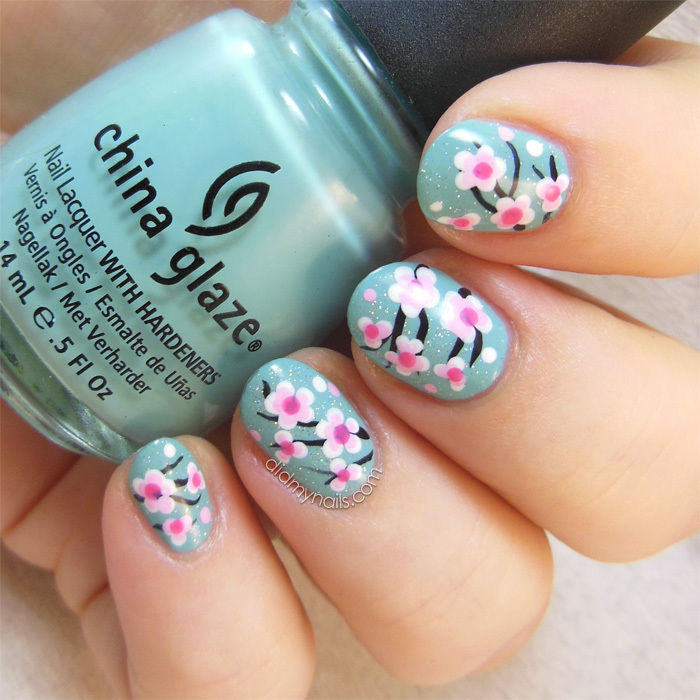 All kinds of squishy love for China Glaze Lotus Begin. From the Spring 2014 City Flourish Collection, China Glaze Lotus Begin is a pale purple that rides the line between pastel and pop. As I described it to Rach a couple hours ago (because I enjoy being a polish enabler): pastel soft, hint of grey, teeniest smidge of cornflower, and yet it's still cheerfully bright. It's magic! The formula was slightly less magical. Not problematic, just not quite China Glaze's usual standard. The first coat was a little patchy, and there was some light pulling on the 2nd. Let it all dry, added third coat, and the coverage was great. Generous top coat definitely helped it level a little better too. I happen to have a very high-arching c-curve to my pinky nail, and if a polish has any issues at all with leveling that's where I'll see it first. And it doesn't take much--a lot of otherwise lovely polishes just can't make that sharp turn at the drop-off. Lotus Begin did leave behind a bump here or there, but especially with top coating it's nothing noticeable at a normal viewing distance. And it's certainly nothing that'll stop me swooning over this incredible colour. Or painting flowers all over its face to wear again tomorrow. It really is a perfect shade for spring and summer sun! Psst... Don't forget to enter the Thirdversary Giveaway! Beside the Skinfood polish giveaway (which all the cool kids are totally entering and stuff! ), I also celebrated DMN's thirdversary by flashing back to my first ever post, which basically went, "No idea what doing yet, me have cherry blossom nail art, which button push make blog go now?" Augh, I was such a bundle of nerves! I actually have some of those jitters again, just coming back after such a long, weird time away. I really wanted to do something new and awesome for my first manicure back, but it just felt kinda right, going back to the beginning. I've done a kablillion sakura manicures in a bunch of different ways in the last three years, but since I was doing a real revisit I wanted to stick close to the same style as then. The base is, once again, China Glaze For Audrey. I did put the China Glaze Fairy Dust glitter under the flowers this time, which I did with the same Orly black striper, my same old dotting tools, and the same Revlon Colorstay Passionate Pink. I had to use a different white this time--Sinful Colors Snow Me White, which I also mixed with the Passionate Pink to add some little light pink bits. These nails always make me so happy! Of course it helps that For Audrey is my favourite fave of all time. Also I think Fairy Dust might literally be particulate magic. I'm still getting used to the new nail shape. I miss my nice, squared nail tips, but a catastrophic break of pain-inducing proportions necessitated the change (it also necessitated some truly vehement swearing and a lot of very dramatic shaking my fists at the sky). I'm seeing a lot more rounded tips again, though, so who knows--maybe these'll grow on me? Dun Dun DUN... I'm baaaaack! Six months? Seriously, six whole months?! Wow. One hand, the time totally raced. Other hand, an eternity. Real life went so ridiculously bad, and I will never be able to repay my family and friends for all the love and support. And now? Life is good again! Super, super good! For a while there I was going whole weeks without thinking or caring about the state of my nails, but it's time to kick off this blog again! Because my nails are finally growing back (stress, packing, unpacking, travel, more stress, even more unpacking...), the bug has bitten me again, and today marks three years since I first started Did My Nails. So, to celebrate this threeversary and the end of my hiatus, I'm throwin' a giveaway! I wanted the prize to be something fun, maybe something most readers/followers couldn't buy at home, which led me to these pretty polishes by Korean cosmetics brand Skinfood. I've been ubercrushing on those little 8ml milk bottles for years, and the shades are so on right now, like a big tray of sweet, colourful macarons! I couldn't resist adding a couple of the (10ml) Vita shades too, including one of my all-time faves, BL514, and yes, the names are exactly that descriptive. So! Two 10ml. cremes, seven 8ml. milk cutie pies, and because why not, a matte/satin black and white glitter. This giveaway is absolutely open internationally (but please remember that I have no power over your country's mail sorters and carriers). I originally planned to be all slick with entries for Pinterest and Twitter and blah blah blah, but I decided to keep this one nice and simple. I need your first name and email address because I gotta email the winner. Extra entry if you follow DMN via GFC and/or Bloglovin'. Easy peasy. This giveaway will be open until the 20th, after which I will email the randomly chosen winner. S/he will have 48 hours to respond or another winner will be chosen. Do not take giveaway internally. Check with your doctor before beginning this or any other exercise program. In your grocer's freezer.